Washer and clothes dryer rentals are made easy through Appliance Warehouse of America. Lease a Whirlpool washer and clothes dryer for your in-home laundry needs from the nation's premier washer and dryer rental company. By clicking above you can select your appliances, complete the rental application and have a large capacity washer and clothes dryer installed in your home. Our washer and dryer rentals include delivery, installation, service calls and the removal of your washer and clothes dryer at the end of your rental agreement. Whether you call home a condominium, an apartment or a single family home, Appliance Warehouse of America has a solution for you. 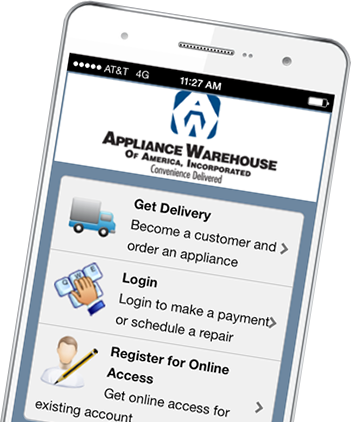 Appliance Warehouse of America is your source for fast, convenient and reliable delivery of all your washer and clothes dryer rental needs. If you are an apartment community looking to lease washers and clothes dryers, please call us at 800-693-4343 for a program customized to meet your needs. If you are and individual looking to lease a washer and clothes dryer call or click above to order your washer and dryer today.